“Taras Shevchenko, The Critical Reception” is the most comprehensive commentary on texts about Shevchenko’s literary and artistic work, published during his lifetime and in the first year after the death of the poet. The book contains 222 documents in different languages. Articles, reviews, notes, useful references in Ukrainian, Russian, Polish, German and other languages ​​are presented in full, in particular, the articles devoted not only to Shevchenko personally but also to Ukrainian literature in general, and to collections where Shevchenk’s works were published, and books in which his illustrations appeared. Many of the cited publications are introduced her for research purposesfor the first time. Almost all the texts are first printings. In addition to the textual and real commentary, the summary contains an annotated index of names, as well as indices of Shevchenko’s works. 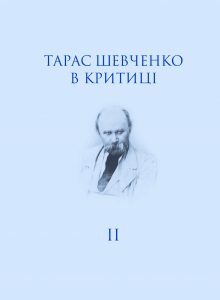 Volume II of “Taras Shevchenko, The Critical Reception” covers the material that appeared during the first year after the Shevchenko’s death, from February to December 1861.